Cavendish Care, a leading provider of social care services for adults with learning disabilities and Autism have been awarded the highly prestigious Gold accreditation by Investors in People (IiP) following a recent assessment against IiP’s stringent standards, demonstrating their commitment to providing continuous improvement and individual progression in line with their company values. 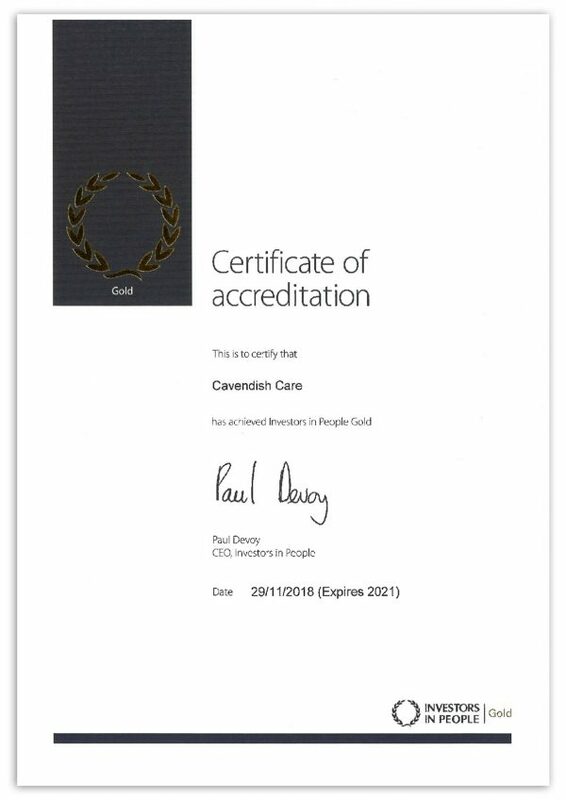 This places Cavendish Care within the top 2% of circa 14,000 organisations accredited by Investors in People, and one of only a select few to achieve the Gold accreditation from the c7600 services registered with CQC in the London and the South East regions. The Gold accreditation comes at a time of numerous successes for the Surrey based company; as they celebrate 20 years as a social care provider, as they continue to grow the number of families and social care authorities with which they work from wider areas of the country (from South Wales to East Anglia), and as it opens its new Activity and Recreation Centre in Crawley, West Sussex. The IiP accreditation report showed that “Cavendish Care are operating above the standard of other IiP accredited organisations within the Social Care field”, that “their management team are inspirational and grounded” which results in “exceedingly high levels of employee engagement” and “enables staff to deliver a high quality and caring service for their residential clients and supported living tenants”; fantastic feedback as Cavendish Care prepare for upcoming CQC inspections, looking to achieve an ‘Outstanding’ rating, CQC’s highest, improving on the “Good” ratings which all of Cavendish Care’s services have held for over 5 years. Commenting on the Gold award, Directors Patrick and Beverley Winchester said “This award is such a testament to the extraordinary professionalism and level of care our staff provide. Everyone works so hard here at Cavendish Care, so to be recognised for the core of what we do – the training which results in our high standards and the delivery of the best quality of life we can to the people we support, means the world to us. The investment in the Training Centre along with the appointment of a dedicated Learning and Development Manager sets the foundation for future capabilities and learning and development at all levels. This has enabled Cavendish Care to not only to provide first-rate internal training, but to also offer this training to businesses in the surrounding area. Cavendish Care’s objective has always been to provide a higher calibre of people development and this accreditation clearly demonstrates the correlation between the investment in people development and successful business outcomes. This now sets Cavendish Care on a three-year pathway to Platinum accreditation with IiP, and the continued development of people which comes with this journey will be reflected in the quality of care and support which is provided to the clients and tenants at this aspiring industry leader. Next on Cavendish Care’s agenda: an ‘Outstanding’ rating from CQC!